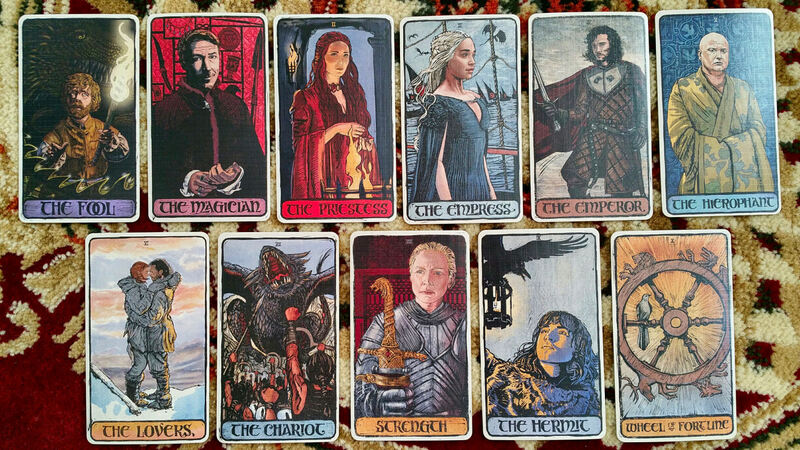 The Game of Thrones Tarot. 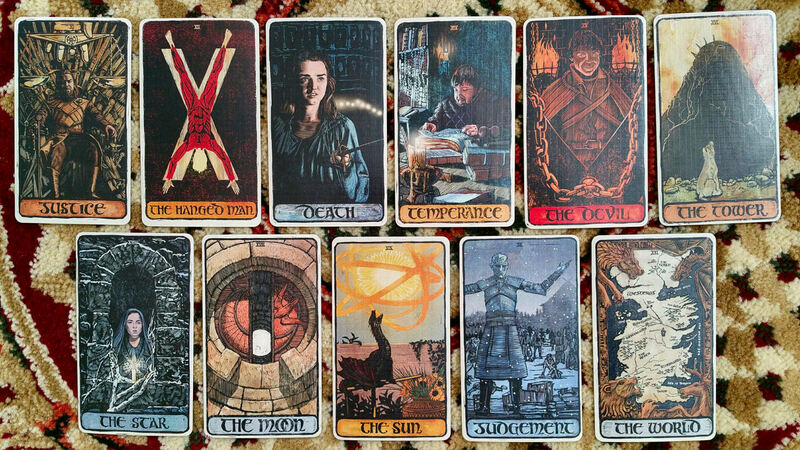 If you watch GoT and you’re a tarot reader, I’d be shocked if you didn’t get this deck. So many of us were salivating while waiting for it after the first preview photos surfaced on the interwebs. Plus, the production quality is spectacular for the price. I love that the creators went in the direction of hand-drawn (or at least it has the appearance of hand-drawn) illustrations rather than photography. Had this been a photography deck, I wouldn’t have bought it. I love the correspondences here, meaning which characters are assigned to which keys. The deck set comes in a beautiful flip top box and the packaging is collectors-worthy. Love the card back design. 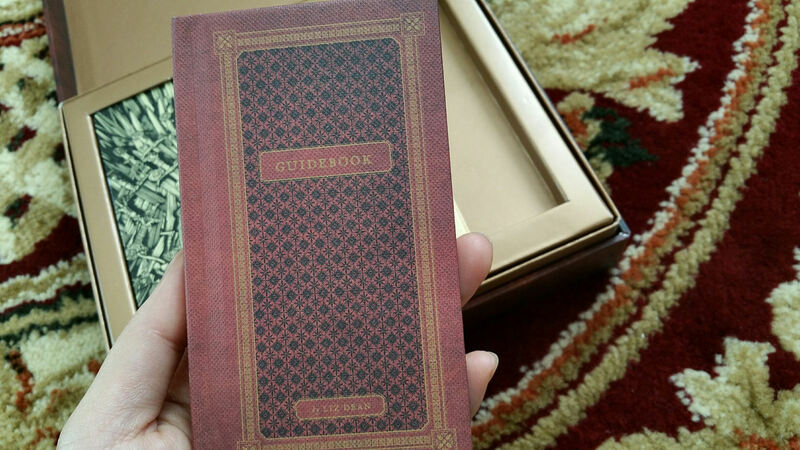 The Guidebook is written by Liz Dean, which means you know it’s good. She’s one of the leading voices in contemporary tarot. And I love how they designed the book, too. 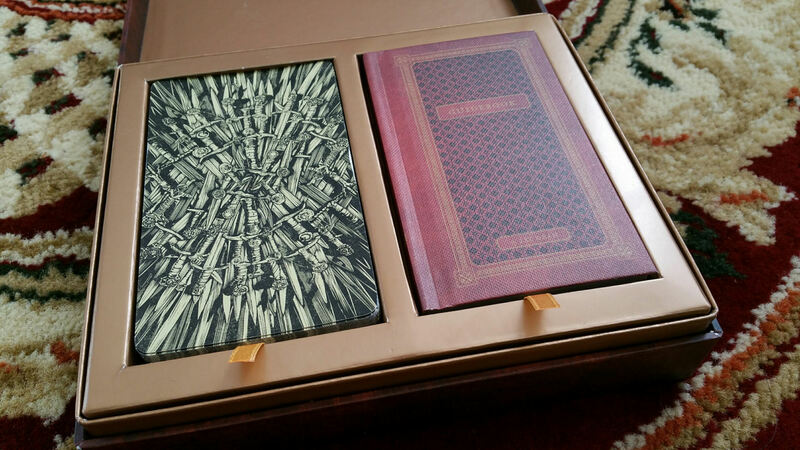 It’s hardcover and mimics a medieval illuminated manuscript. If you want to check out the close-up of the cards, click on any of the linked photos. The cardstock is this really beautiful knitted or woven canvas type stock (I don’t know the tech terms) and is slightly muted rather than bone white. I love it. 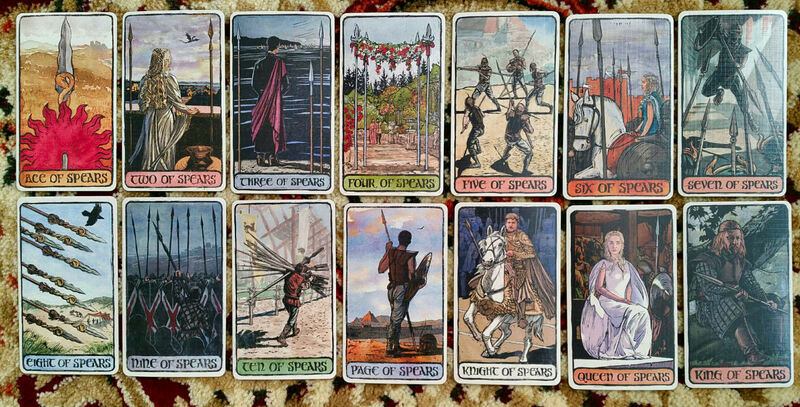 I’m intrigued by the change of the Wands suit to Spears, similar to Lances, which are attributed to Fire and I think is a great replacement for the suit of Wands here for the GoT deck, so I love that detail. Well done. For the most part the imagery follows the Rider-Waite-Smith, which makes this deck really easy to work with for RWS readers. Yay. When the preview images first came out, only the Majors were shown, so I was afraid they’d go lazy on the Minors (which a lot of art decks do, case in point, the China Tarot or the XIII Tarot by Nekro), but no. Thank goodness no. The creators delivered. Here’s the funny thing. For “serious” tarot readings, I generally avoid decks that get pop-culture-y or are based around a kitschy theme. Sure, I collect a shitload of such decks, but wouldn’t use them for a reading I cared about. 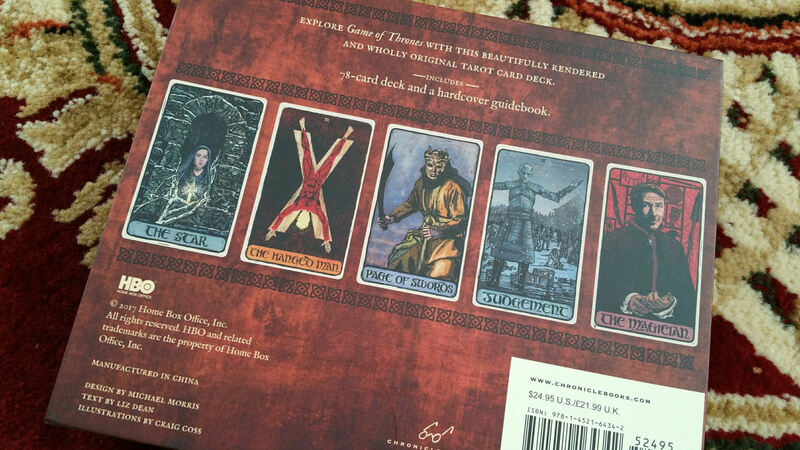 But I actually love the Game of Thrones Tarot. It shouldn’t work as a serious reading deck and yet it does. I think it’s the art. The art is just spectacular. Conceptually my presumption would be this deck can’t work for a professional reading, and yet I think it does. It reads very well. That’s the funny thing. The illustrations done by Craig Coss are so good, it made me want more tarot decks by this guy. I went out of my way to see if he illustrated any others. Sadly, all I found was a Goddess Coloring Book. Here’s me sending out a wish to the universe that the big tarot and oracle publishing houses take notice and hire this guy to create more decks. There was no way I wouldn’t be getting this deck, and I’m happy to report that the deck delivers. High quality production, beautiful art, every detail here made for the tarot aficionado and deck collector. Obviously, you need to get two copies, right? One to open and use right now and one to leave in original packaging for the future? I confess not being able to comment much on the actual guidebook since y’all know I just got this deck to go, “ooh, pretty!” That said, Liz Dean is top notch in the tarot world. HBO and the publishing house could not have gone with a more fitting author to write the guidebook for the Game of Thrones Tarot. Wow! The artwork alone is gorgeous, but it’s GoT, which makes it even more desirable! Thank you for sharing Benebell. I did not buy this deck because I thought it would be a bit too pop-ish. I am a huge Game of Thrones fan and have read the all books and watched the shows on HBO. 💖 Thank you for sharing the brilliant artwork and showing me that I was wrong, and should have explored deeper before throwing the whole idea away. That said, for me the creator made a mistake by not putting the actual royal families together in the court cards. That was a given, I thought! The personalities and families of GoT were perfect for the courts. Say what? Missed opportunity. Took the wind out of my proverbial sails about the deck. Not sure if I will buy it. Ya anyone who actually knows tarot will be disappointed a bit. Its just lazy on their part. I got it and was super impressed with it. Kind of fence-line. I am new to GOT (mainly season 6 and 7 with a few scenes watched from earlier) and I was able to ID where in the show the card is from. Which means limited stories were used. Instead of repeating characters they could have added others. I also don’t like how bendy the cards are. Works to riffle shuffle I guess, but it’s not how I like my cards. I’ll read the guidebook but I’m not sure I’ll keep the deck. Such a missed opportunity. The 4 suit could have easily been the primary 4 houses. Stark cups targ wands lanister swords baratheon disks. Lovers r+l. Tower duh. Some of the archetypes fit so well to kow mad king,wow dang,knightow visarys. Kos tywin qos cersi knightofs Jamie page tyrion. Ned cat rob salsa for cups. Stannis kop Margery qop renlypage Robert Knight. Sun red comet Jon temperance. I’m reading at a Game of Thrones party, so I had to get this deck! Some of the choices are ingenious–blind Arya with Needle and her wooden sword for the 2 of swords–but a few I would have done differently; a lot of characters are repeated, and a lot are left out. And by creating the deck before the series is over, we are surely missing some new characters and some aspects of established characters. The book, box, and linen finish of the cards make it a quality deck. 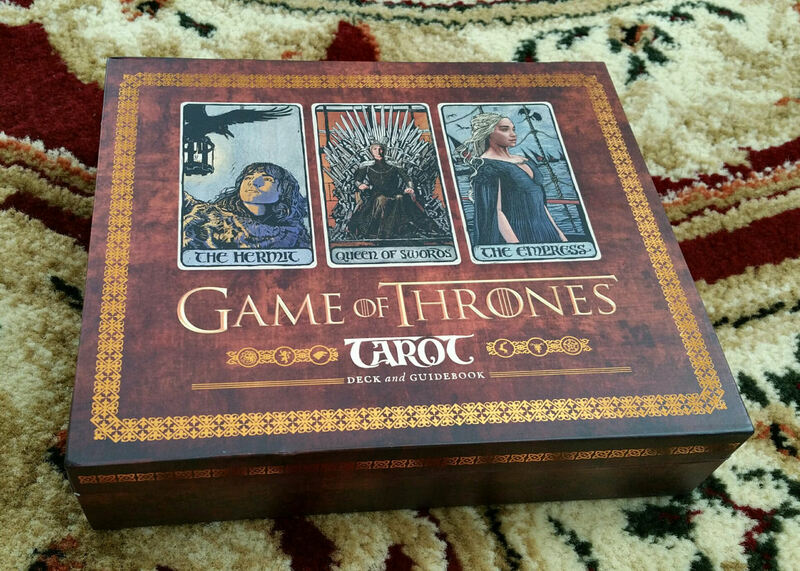 As a fan of both Tarot and Game of Thrones, I am quite pleased with the deck!